This quarter, for some is the first of the year, for others, it begins the end of the year, the “tails” or new budgets. Started by beautiful sunny and warm days, tans settled “in town” in the whole of Europe. To raise morale, although battered by the risk of terrorism. But what is most reassuring is that creativity, new trends of our changing lifestyles at work that are exhibited and abound at trade shows this year 2016, are extraordinary. Their wealth, the diversity of colors, clean lines, are protecting us against terror of minds. Thank you to manufacturers, designers, distributors who exhibit, striving to illuminate our daily work. In the pages of this issue, a “preview” ORGATEC 2016 whose theme this year is “rethink the work” “The Future Work – New Visions of Work,” and in the standard sections, objects and “processes” that take care of our health. 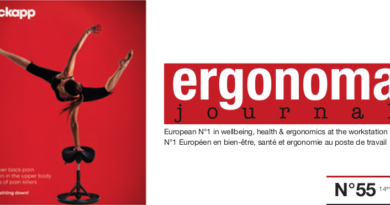 Ergonoma will be present at Orgatec, visit us Passage Hall 3 Hall 11 Stand P0003, see you very soon!